Sir John Fowler, Sir Benjamin Baker, Sir William Arrol & Co. The Forth Bridge. Image courtesy of Kim Traynor. The bridge is located adjacent to the newly constructed Forth Road Bridge. Image courtesy of Derek Bathgate. The famous bridge made use of 54,000t of steel and seven million rivets. Image courtesy of Simon Johnston. An original rivet used for the Forth Bridge. Image courtesy of Harvey Henkelmann. Forth Bridge was the most prominent steel structure when it became operational in 1890. The cantilever railway bridge was built across the Firth of Forth at Queensferry, 14km west of Edinburgh. It still continues to remain a significant and admirable engineering structure of the Victorian era. "The painting work on the whole Forth Rail Bridge was completed in December 2011 and is expected to last for 25 years." The 8,296ft long railway bridge acts as a significant thoroughfare connecting the north-east and south-east of Scotland. The bridge primarily connects the cities of Edinburgh and Fife and further leads to Dundee and Aberdeen. 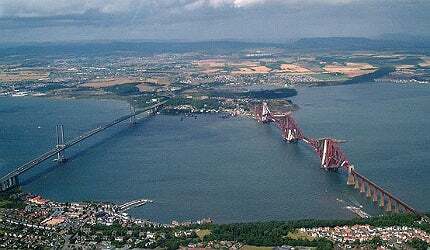 It is located adjacent to the newly constructed Forth Road Bridge. The bridge was designed by Sir John Fowler and Sir Benjamin Baker and built by Sir William Arrol & Co, a Glasgow-based company. Much credit, however, has been given to Sir Benjamin Baker and his co-worker Allan Stewart for designing and supervising the construction work. The bridge is owned by Network Rail and is used by ScotRail and other intercity services. It was refurbished and repainted in 2011, by Balfour Beatty. The plan to construct the Forth Bridge was brought up after a former project to construct a suspension railway bridge at the Firth of Forth, designed by Sir Thomas Bouch, was halted because of the collapse of the Tay Bridge at the Firth of Tay in 1879, which was also built under his supervision. Authorisation and contracts to build the Forth Bridge were given in 1882, with the acceptance of the cantilever structure designed by Fowler and Baker. The bridge was designed to withstand strong winds, as the Tay Bridge had collapsed because of such weather conditions. Construction work commenced with the capital for construction funded by Midland Railway (32.5%), North British Railway (30%), North Eastern Railway (18.75%) and Great Northern Railway (18.75%). The total cost for constructing the bridge was estimated to be £3.2m. The bridge was first tested and used in January 1890, where two 1,000ft long trains consisting of a locomotive with 50 wagons each passed across the bridge side-by-side through the south entrance. Forth Rail Bridge was finally commissioned in March 1890. Forth Bridge is 8,296ft long, with trains passing through the double track at a height of 158ft and the towers, which reach a height of 361ft. The two main spans of the bridge are 1,710ft, the two side spans are 680ft and the 15 approach spans are 168ft. The bridge consists of three separate four-tower high, double-cantilevers which are joined by 350ft long girders and connected to the main structure of the bridge by huge rivets. The cantilevers are supported by granite piers. The river bed at the south cantilever, which is 91ft below the high-water level, made use of compressed air to stop water pouring into the working chamber at the base, while the other cantilevers were constructed using caissons measuring 70ft in diameter. Foundations were constructed using cylinders which were lowered using sandbags. Working chambers were created to pump compressed air, whereas airlocks and airshafts provided access for men and materials. Bridge construction was carried in two phases. The first phase which was carried out from 1882 to 1885 involved works on the substructure, including sinking the caissons and constructing the foundations and piers to support the superstructure. The superstructure, which weighs about 51,324t, was built from 1886 to 1890. Altogether, the construction of the bridge made use of 54,000t of steel, 20,950 cubic metres of granite, 6,780 cubic metres of stone, 49,200 cubic metres of concrete, 50t of cement and seven million rivets. Steel used for the construction was manufactured by Frederick Siemens (England) and Pierre and Emile Martin (France). Construction work was carried out by approximately 5,000 workers. The painting work on the whole Forth Rail Bridge was completed in December 2011 and is expected to last for 25 years. "The bridge is owned by Network Rail and is used by ScotRail and other intercity services. It was refurbished and repainted in 2011, by Balfour Beatty." The refurbishment contract worth £40m was first awarded to Railtrack in 1996 after which works began in 1998. Railtrack gave up the refurbishment contract in 2002 due to financial reasons. Balfour Beatty then took up the refurbishment work under a £130m contract. Under the ten year project Balfour Beatty carried out the refurbishment works which included the repairing of the steels, coating of the surface, improvements to the access of the bridge and upgradation of the flood lightings. The company used a method of blasting the old layers of paint which enabled the steel to be repaired. Zinc-based primer of 35 microns was used to prevent corrosion and 400 microns of glass flake epoxy intermediate coating was used to act as a barrier, after which 35 microns of polyurethane gloss top coat was used to provide the finishing touches. The work involved up to 1,500 people at its peak, with an average of 400 people working on the bridge daily. Balfour Beatty used Pyeroy for the painting work and Harsco Infrastructure for the scaffolding work. Scaffolding work included enclosing the bridge in up to 4,000t of scaffolding by reversing the established ground-up approach. The access platforms were enclosed in plastic sheeting to avoid paint being blasted into the environment and to protect the glass flake paints while drying. The painting work was done by shot-blasting the previous paint layers and applying primer, glass flake and polyurethane coatings. Vital was appointed as the subcontractor for the automated track warning system (ATWS), safety maintenance, support and safety road rail vehicles (RRVs). The railway bridge carried about 30,000 passenger trains in 1907 with a gross weight of 14.6 million tons, while in 2000 the bridge carried about 54,080 passenger trains and 6,240 freight trains with a gross weight of about ten million tons. The bridge witnesses 190 to 200 train movements on a daily basis. It provides about 150ft of space for ships and boats to ferry underneath it.